My work focuses on how normative elements - such as political ideas, ideologies or values - shape both the ends and means of contestation in political contexts widely described, by actors both within and without, as bereft of principle. In my research I address questions like: How are material practices embedded in normative frameworks? If, as many African politicians argue, the primary aim of politics in African countries is development, then how is development understood? My PhD thesis looked at how politicians and voters engage with one particular normative concept that has been heavily promoted by international development organisations and donors: good governance. Values like accountability and transparency help explain political contestation around the Oyo State gubernatorial elections in 2011 and 2015. However, these core values are conceived of in ways that challenge widespread assumptions both about the nature of 'good governance' and corruption. My ongoing research explores in more depth how political competition in Nigeria offers new ways of conceptualising core political problematics like legitimate distribution and transparency. ​Please email me if you would like a copy of any of the draft papers below. Transparency and mistrust: Who or what should be made Transparent? The relationship between trust and transparency of government is not straightforward. Troubling developments around the world, namely the rise of right-wing populism and President Trump, have raised the possibility that the technocratic forms of transparency governments currently champion are insufficient. Politicians like Trump perform a salient alternative conception of populist transparency based less on documents and data and more on honesty and authenticity to cultivate trust. Putting the U.S. into comparative perspective with political contestation in Nigeria, transparency proves to be similarly ambivalent: highly technocratic conceptions of transparency have at times faced popular mistrust. A series of qualitative case studies show that in Nigerian politics calls for transparency apply not just to data, but also to the social networks in which politicians are embedded. At times this demand for ‘transparency in people’ may clash with traditional transparency practices, thus helping provide fresh conceptual insights on transparency and trust. This article argues against the long-standing instinct to read African politics in terms of programmatic versus patrimonial politics. Unlike the assumptions of much of the current quantitative literature, there are substantive political struggles that go beyond ‘public goods good, private goods bad’. Scholarly framings serve to obscure the essentially contested nature of what counts as legitimate distribution. This article uses the recent political history of the Lagos Model in southwest Nigeria to show that the idea of patrimonial versus programmatic politics does not stand outside of politics but is in itself a politically constructed distinction. In adopting it a priori as scholars we commit ourselves to seeing the world through the eyes of a specific, often elite, constituency that makes up only part of the rich landscape of normative political contestation in Nigeria. Finally, the example of a large-scale empowerment scheme in Oyo State shows the complexity of politicians’ attempts to render distribution legitimate to different audiences at once. Elected representatives should be accountable, but what does accountability mean? Over almost three decades of governance reforms lead by international donor institutions accountability has become a buzzword in the good governance agenda. The underlying assumption of accountability as essentially a principal-agent interaction has been surprisingly resilient, withstanding waves of critique and reform to donor programming. Insights from in-depth qualitative fieldwork in southwest Nigeria suggest that actually existing conceptions of accountability – that is, the things that politicians do that render them accountable in the eyes of their constituents – differ radically from dominant donor ideas. Accountability as accessibility expresses the importance of a relationship between rulers and the ruled as one requiring visibility and direct communication, even in the absence of those in power delivering any tangible benefits. This article elucidates a new conceptual framework to make sense of accountability as accessibility. Combining African scholarship on the post-colonial state with work on ‘conversational democracy’ in the UK, accessibility emerges as a key means by which power is made accountable, not just in Nigeria but in a variety of non-African political contexts. Earlier versions of this paper was presented at the African Studies Association UK Conference in Cambridge in September 2016; the Oxford African Studies Seminar in February 2018; and the Normative Politics in Africa workshop, LSE 9th May 2018. How do those values forged in the crucible of small-scale moral economies relate to broader political values? In his influential 1994 paper ‘Moral Ethnicity and Political Tribalism’ John Lonsdale argues that values of the homestead or the village – usually framed in terms of ethnicity – provide a normative underpinning for political contestation within the state arena: the tragedy is that this act of translation so often fails, whether in Africa or elsewhere. This article highlights the enduring value of Lonsdale’s theorisation of moral ethnicity whilst drawing attention to the weaknesses of his larger theory of how morality relates to politics. Lonsdale’s exposition of Kikuyu political thought, as evidenced in debates within Mau Mau leadership in the 1950s, should be understood as an example of ‘moral politics’ which shares much with conservative political thought elsewhere. Whilst rejecting Lonsdale’s implicit claim that moral politics is the only form of normative politics, we can take his account of accumulation within the village as a powerful creation myth that allows us to rethink the starting point of political thought. The task of making inequality ‘reputable’ is one that liberal accounts of democracy struggles to engage with, but nonetheless is central to addressing the material inequality and lack of responsibility that characterises 21st century politics. Thus this article connects the emerging research agenda of normative politics in Africa with ongoing debates about hierarchy, material inequality and the role of morality in politics. Paper presented at 'Patronage, Politics and the Moral Economy of Electoral Politics' panel at the African Studies Association UK, University of Birmingham, 11th September 2018. Recent calls to decolonise the university and, in particular, development studies, have problematised the way that knowledge about the developing world is controlled by elite institutions (Kwoba, Chantiluke, and Nkopo 2018). As new funding regimes create new organisational structures, the effect of large grant-funded research centres on the maintenance of old paradigms or the emergence of new ones has yet to receive scholarly attention. This paper explores how the neopatrimonialism paradigm (Mkandawire 2015) - the world view whereby politics in the global South is essentially characterised as driven by the personalistic power of calculative elites herding irrational but docile masses - has been sustained by the institutional structures of two large grant-funded research centres at a Russell Group University. The centres advance the concepts of moral populism and the political marketplace to rethink public authority in “more open and less normative” ways. Drawing on existing work on how policy paradigms are embedded in organisational structures, this paper argues that the hierarchical structure, insulation from internal critique and lack of academic accountability lead these centres to unconsciously engage in maintaining the neopatrimonialism paradigm. The Normative Politics in Africa workshop held in LSE in May 2018 presented the results of a series of collaborative workshops, involving scholars from the Global North and South. The call for papers sets out the core themes of this series of workshops. Details of participants and papers can be found on the programme and list of abstracts. A special issue is in the works, the introduction to which sets out the core arguments. 1. Political Studies Association conference 2019 April 15th Nottingham Trent: "Normative Political Ideas between the Global South and Global North". The role of given to ideas has historically represented a point of divergence between the study of politics in the West and in developing countries. In the West, political theory and political theorists themselves are valorized as addressing some of the most important questions concerning our shared life. By contrast, where ideas have entered the study of non-Western contexts, this has often been in the form of euro-centric universalist ideas, used as standards against which Southern countries are evaluated. Indeed, to decolonize our study of African we must to rediscover the role of ideas, and use the comparative study of political ideas to bring African, and other Global South experiences, into conversation with politics as studied in the West and elsewhere. As part of this panel I will be presenting: Socially embedded not personalistic: public-ness and politics in Nigeria and beyond. Returning to long-standing debates about the connection between the public-private divide and good governance this paper argues that Nigerian politics shows that politics can be socially-embedded in a way that defies categorisation as personalistic, moral or restricted to small-scale communities. I also have a sustained research interest in the politics of Northeast Nigeria. I have published on the dynamics of the Boko Haram insurgency and the state's response (see Framing and blaming: Discourse analysis of the Boko Haram uprising, July 2009). 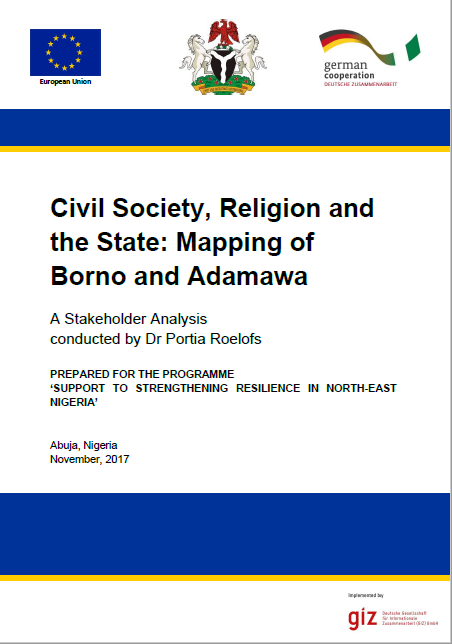 In November 2017 I authored a report "Civil Society, Religion and the State: Mapping of Borno and Adamawa". The report was conducted for the GIZ programme ‘Support to strengthening resilience in North-East Nigeria’ which focuses on governance, livelihoods and infrastructure in areas affected by the Boko Haram insurgency. It is based on fieldwork conducted in July-August 2017 in Maiduguri, Yola and Mubi. I will be presenting a paper drawn from this research at the African Studies Association UK in September 2018 as part of the 'Honouring Raufu Mustapha' stream's panel on Nigerian Politics. Interfaith peace-building programmes rely on the idea that social contact between disparate groups will breed tolerance and trust. This article is about how interfaith social-contact came to be a site of intervention by the United States in northern Nigeria, and how the pursuit of inter-faith social contact created opportunities for various actors to create opportunities on the basis of being either ‘international’, ‘local’ or both. Firstly it focuses on a specific inter-faith peace-building programme implemented by one of USAID’s local partners, highlighting the way that contradictory claims of local knowledge and international expertise play out. Secondly the article draws on fieldwork in Borno and Adamawa to compare the implicit model of social-contact – where more and deeper contact is always better – with attitudes towards interfaith local contact among local religious leaders. Practitioners should be aware of the potential for disconnect between expansive aspirations for social contact as a route to peace and the more minimal ‘local’ visions of appropriate social contact.